Beat to quarters! Clear for action! Trim to battle sails! Run out the big guns! Arrgghh, Matey! 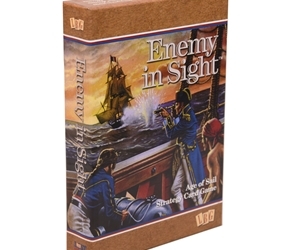 There's an Enemy in Sight, broadsides to be fired, prizes to be taken and fun to be had in this exciting card game of chance and skill depicting the age of fighting sail. John Paul Jones and Lord Nelson sail the seas again on your gaming table in this easy-to-learn card game for two to six players.